” The Ivory Trade – Elephant Poaching Adverts contribute towards site running costs, but currently may not fit with the site ethos. We will continue to work on a solution. What Is Ivory Used For? Is Anything Being Done To Stop Elephant Poaching? The ivory trade is the primary reason that the endangered elephant population world wide is diminishing at an alarming rate. Other species killed for their ivory tusks are the hippopotamus, walrus, narwhal and mammoth. Poachers move from place to place where the elephant population has not yet been obliterated, wiping it out wherever they go. Despite an international ivory trade ban being in place, there has recently been a surge in this illegal and brutal practice. Image: Poachers kill elephants using methods such as using a poisoned dart – which results in a slow and excruciatingly painful death for the animal, by shooting them with machine guns, or even stoning them to death. Poachers slaughter entire herds of elephants when they gather to drink at waterholes. Poachers mercilessly kill elephants so they can sell their ivory tusks. Today, it is thought that most of the ivory is illegally smuggled to China and Thailand to make chop-sticks, jewellery, ornaments, hair accessories, and many other items. Image: Various items made from ivory from elephants tusks. Growing demand for ivory in China is “the leading driver behind the illegal trade in ivory today,” said Tom Milliken, an elephant and rhino expert for the wildlife trade monitoring network TRAFFIC. From 1979 – 1989 the African elephant population dropped dramatically from around 1.3 million to just 600,000. During each of these years, around 75,000 African elephants were killed for their ivory, worth around 1 billion dollars annually. Around 80% of the elephants were illegally killed. Today, one kilogram of ivory is worth between $1,000 and $1,500 in the Asian market, and each elephant tusk can weigh 10 kilograms. Just one tusk can be worth around £40,000 (UK),or $63,000 (US), once it is carved in to various items. 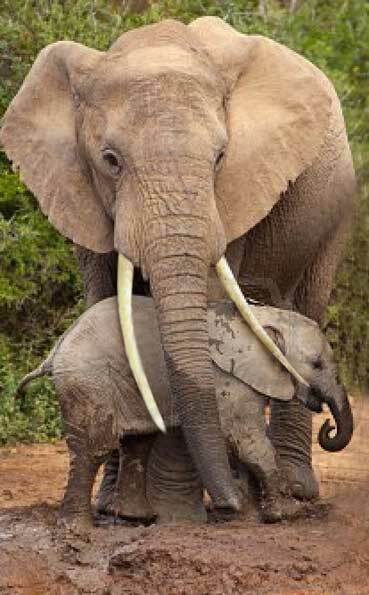 Image: A mother elephant holds her baby close, protecting it. Numerous baby elephants are left orphaned after their mothers are killed for their ivory tusks, which are worth around £80,000,or US $126,000 for a set of two, once they are made in to ivory items. If orphan baby elephants survive to grow tusks of their own, they too may well be killed by poachers, in one of a variety of painful, distressing and frightening ways. When the ivory trade in African elephants was initially banned in January 1990, some South African Countries, were strongly opposed to it. These countries were Botswana, Namibia and Swaziland, and the ring leaders, South Africa and Zimbabwe. South Africa and Zimbabwe had actively worked to reverse the decision and had supported ivory traders in an attempt to maintain the trade. However, their arguments for overturning the ban were found not to be entirely honest. Sadly, the brave whistle blowers who exposed Zimbabwe’s lies ‘mysteriously’ ended up dead. Southern African countries have continued to push to overturn the ban on the international ivory trade. Zimbabwe’s President Mugabe, who is strongly suspected of giving tonnes of ivory to China in return for weapons, has lead the way and had some success. 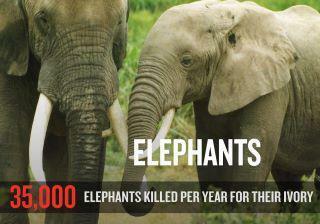 Image: Around 35,000 elephants are slaughtered every year for their tusks, to supply the ivory trade. This is on the increase and nothing much is being done by countries to protect the elephants that live there. As a result, their existence as a species is endangered, due to the alarmingly high rate of continuous killings. International trade in Asian elephant ivory was banned in 1975. Ivory traders are not concerned whether their the ivory is from Africa or Asia and they continue to be killed illegally on both continents. This is not made particularly difficult by authorities. The illegal Ivory trade in Thailand and China continue to thrive today. The number of ivory products for sale on stalls at markets in Thailand, and the number of retail outlets selling them, has increased since 2001. Thailand has a huge amount of both Asian and African ivory openly for sale. WWF International’s analyst on wildlife trade issues says “The Thai Government needs to crack down on this serious illegal activity and stop allowing people to abuse the law”. The trade there is the cause of many elephant killings in both Asia and Africa. The capital, Bangkok, a popular tourist destination, is the main hub for illegal ivory activities in Thailand. Also blamed for the increase in elephant poaching is China’s economic growth and it’s high demand for ivory. Image: Carved ivory items for sale on market stalls (top) and shops (bottom) in Asia. Corruption is rife with Governments and officials taking bribes to ‘look the other way’. If guards do tackle the poachers, their lives are in danger, as poachers seem to think nothing of murdering people, just as they do defenceless animals. Governments that were opposed to the international ivory trade ban in the first place do not put much effort in to stopping elephant poaching in their countries. They have to be pressured in to sending guards to try to protect the elephants, and when they finally do, they do not send anywhere near adequate numbers and do not arm these guards sufficiently. The park is about 2,200 square kilometres and protected by only five unarmed guards. 450 elephants were killed there by poachers on horseback armed with Kalashnikovs, leaving around just 150. The poachers were said to have come from the other African countries, Chad and Sudan. Before this massacre, as few as 1,000 elephants were thought to be left in the whole of Cameroon. Image: Innocent elephants brutally killed, primarily for their ivory tusks. Part of the tusks are buried deep under the skin, so the poachers leave these beautiful animals terribly disfigured after hacking their heads apart in order to get all of the highly prized ivory. 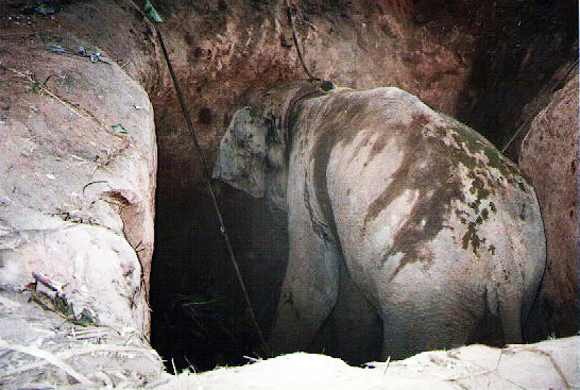 Elephants are also illegally trapped in the wild, imported, and sold in to the tourism industry. This is common in Asia. Their miserable lives become one of being beaten, abused and isolated until their spirits are broken – or ‘trained’ as they call it – to be used as entertainment for tourists and locals. They are never free again as they live chained up or in a tiny enclosure. There are now even places pretending to be elephant sanctuaries,. This is to exploit tourists wishing to only visit places that are for the elephants benefit. As with all businesses exploiting animals, these places do not put the welfare of the elephants before profit. There is some advice you can follow to avoid supporting such places. Elephants are also abused horrifically in the entertainment industry, for example, in circuses. Never purchase anything made of ivory, or that you suspect may be made of ivory. Never purchase anything from shops or sellers who are selling any ivory products, and let them know why. Report these sellers where it is illegal to sell ivory. Share the information on this site as widely as possible on social media and in blogs. It is vital to raise awareness of these issues. Support charities and organisations fighting against elephant poaching and smuggling trades. To find these, enter “Ivory trade” or “Stop elephant poaching”, or similar term, into a search engine or social media site search bar. Do this through a charity fundraising search engine so you can raise money to help animals while you search. Help fund raise for these organisations. Get ideas on ways to do this here. Support campaigns and petitions against the ivory trade and against elephant exploitation. Take part in protests and demonstrations. Avoid supporting cruel animal tourism, and circuses with animals in. Share the information you learn on this site with family and friends, on social media and in blogs. Help animals by sharing the ways to stop animal cruelty you learn with other people, on social media, in blogs, and any other way you can think of. Doing this could mean more people help stop the cruelty, and therefore you are responsible for more animals being saved from suffering. Also share the types of animal cruelty you find on this site, to raise awareness. 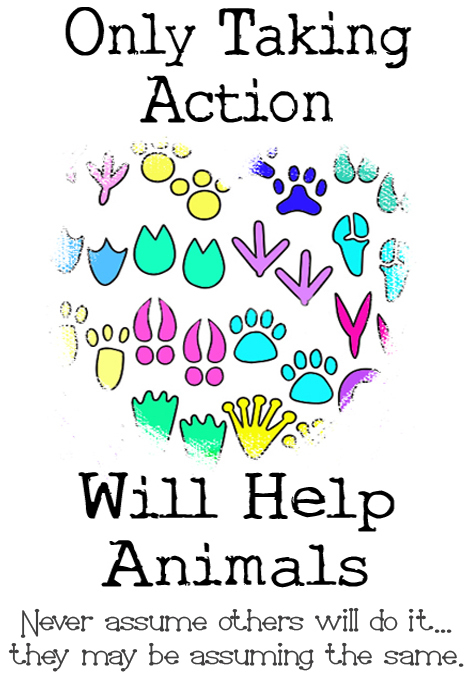 On this site are many varied ways you can help stop animal cruelty, and there are ways that will suit everyone, no matter what your personality or lifestyle. Learn more about why we so urgently need to help stop animal suffering by having a look at the Types Of Animal Cruelty section of this site. It will allow you to broaden your knowledge of many different types of animal abuse that happens in the world.